This is a promotion that you can only avail every Tuesday. You can be awarded as much as 60 free spins if you fund your balance on Tuesday. The maximum quantity you can get per deposit is 20 and this is capped to three times for the entire day. This promotion is only open to players who have already deposited at least once. New players who have never spent real money in this casino cannot participate. In this promotion, any player who successfully convinces a referral to sign up will receive €50 in his bonus balance. On top of this, the player will also receive a 200% matchup of his friend’s first deposit. This matchup is capped at €350. Only players who have completed the registration and deposited real money can qualify. The friend who joined must also deposit before all bonuses are awarded. To join, you simply have to add the email addresses of your friends in the promotion form. You can only invite a maximum of four friends at each time. This limit is in place to prevent bonus abuse. You can add another four friends later on. All bonuses received from this promotion are subject to the general terms and conditions of the casino. The wagering requirement for both the €50 and the 200% matchup is 30X the bonus amount received. These points are rewarded to players and they can be exchanged for real cash. This is also critical to players who are aiming to climb the VIP ranks. Every player will earn 1 point for every €10 wagered. The same condition applies for bets made in USD or GBP. You will only earn comp points if you use real money, not the money in your bonus balance. Any amount wagered using your bonus winnings will not earn you comp points. Once you hit a VIP tier, you will earn more comp points faster for the same amount of money. You can always check your comp points in My Account. This is also the place where you can convert them to money. There are seven tiers to the VIP. Below are the benefits. Member – all players will start at this level and get a 3-day withdrawal time frame and can only convert comp points to cash at a minimum of 95 of them. Silver – eligible for 3-day withdrawal and 90 comp points before converting it to cash. Gold – withdrawal is reduced to two days and comp points to 85. Diamond and Platinum – 1-day withdrawal processing, personalized offer, personal account manager, and 75 comp points as a requirement prior to cash conversion. Elite and Black – same as diamond but comp points are reduced to 70. All VIP tiers provide a birthday bonus to the members. Diamond and up will get a VIP welcome bonus. Silver and up will get a VIP upgrade bonus. Should you receive bonuses as a VIP, keep in mind that the default wagering requirement is 30X. Also, all the bonuses you receive are only valid for 72 hours from the date of issuance. You must also be aware that VIP bonuses are still bound by the wagering contributions of the games. Not all games have the same wagering contribution. Below is a summary. You need to be smart about how you spend your bonus. If you received a €10 complimentary bonus for your birthday, you must wager an amount equal to €300. To maximize your chances of winning, you must play slots and hope that you win a huge amount. Then play on the same slot so the contribution requirement is 100%. Make sure that you wager with the mindset that the bet will lose. Ensure that your bets can last you up to €300. The rest will be yours to convert to cash. This package is split into the first and second deposit bonuses. On the first one, you will receive 200% matchup capped at €350. To avail of this promotion, you must spend at least €40. The matchup percentage is on top of what you have funded. If you deposit €40, 200% of that is €80. 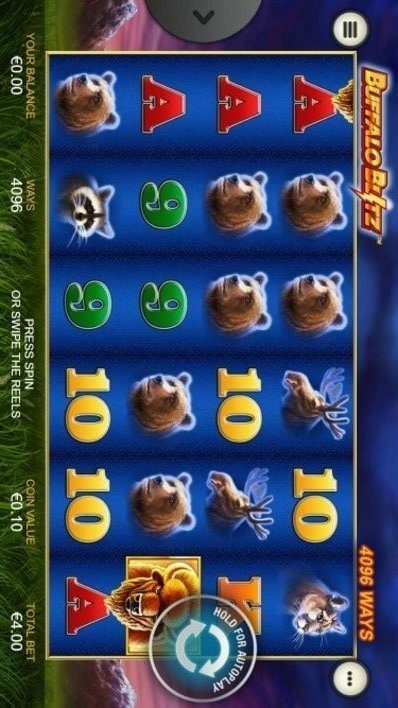 This €80 is the bonus coming from Winner and this is on top of the €40 so you have a total of €120 for playing. The wagering requirement before you can withdraw is 35X the bonus and the deposit amount. In our example, 35X of €120 is €4,200. You must bet a total that is equal to or more than this amount before you can cash out any winnings. The second instalment grants 60% match-up. The bonus is capped at €300 and the minimum deposit is reduced to €20. The casino will only let you win 10X your deposited amount from the bonus funds. In our example, you may hit a jackpot of €100,000 but since you only deposited €40, the casino will only let you withdraw €400. This works best for players who first want to test out the games. You will receive this only if you complete the registration process and if you allowed the casino to verify your mobile number. You can only avail this bonus within an hour from the time of your registration. You can no longer use it once you went past that time frame so make sure you have your phone with you. To be able to withdraw, you must at least spin on a slot 50 times and meet a 50X wagering requirement. This means that you have to wager an equivalent of €1,500 from your bonus money from a total of at least 50 spins. 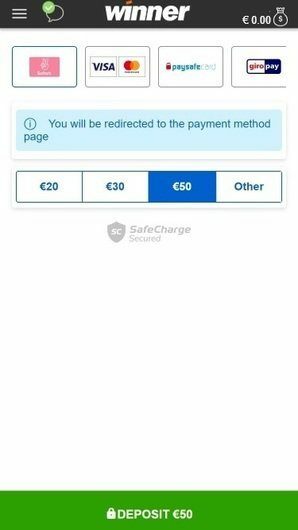 If you are lucky and you met both of these requirements, you must deposit €50 to your real money balance before the casino will allow you to withdraw. Winner online casino was originally established back in 2009 as an online casino based on a single gaming platform produced by the Playtech software development company. The casino has been operating under the management of the Zirconium Gaming Limited ever since. Over the years their gaming platform, which was at first supported only by Playtech, started expanding as new partnerships were made. 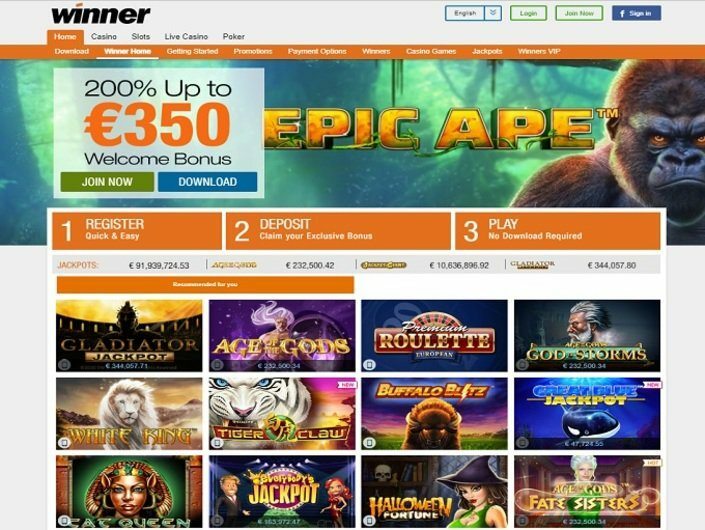 Nowadays, while visiting Winner casino website, one can come across a high variety of casino games developed by some of the companies considered to be the most successful in this field, which can be thoroughly inspected in the following parts of this Winner casino review! The winner is available both as the Winner mobile casino and Winner desktop site. 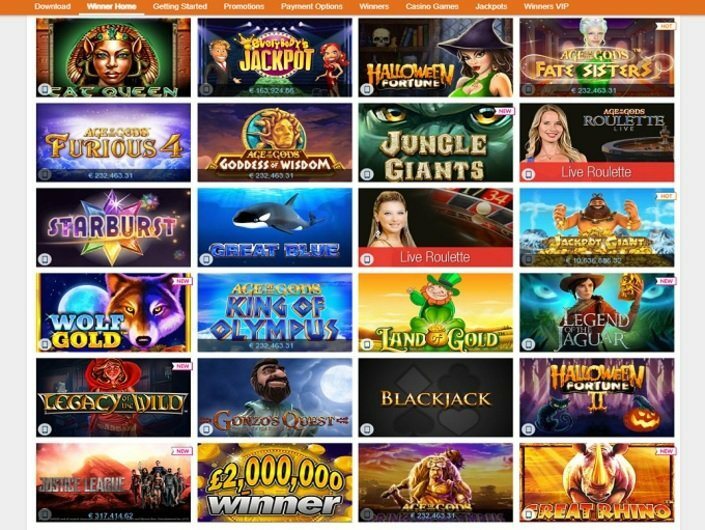 No matter from what device a player is performing a Winner casino sign-in process, the game collection stays the same, and all the games are perfectly adjusted to any screen size or resolution, in order to provide an excellent gaming experience! Unfortunately, due to various governmental regulations, the Winner casino is unable to provide services in just over 20 countries worldwide, including the United States of America, Australia, some European and Middle-Eastern countries. The full list of restricted countries can be overviewed by checking the following Winner review. The casino provides services under the operating license issued by the Malta Gaming Authority. The design of the casino’s webpage is minimalistic, which makes the page very easy to manage. The central position of the welcoming screen is occupied by a banner displaying some of the latest game titles as well as promotions and bonuses. On the left side of the banner, one can notice the Winner sign up window. All games are neatly divided into several categories, for easier managing, and some of the most popular ones can be overviewed by scrolling the webpage to the bottom. As mentioned above, in the beginning, the Winner casino UK was an online casino based on a single platform manufactured by a provider known by the name of Playtech. Throughout the years, as casino started expanding, a new partnership has been made with two software developing companies, the Ash Gaming and the NetEnt. This has expanded the game collection, even more, bringing in new, exciting, high-quality games. Nowadays the offer of the Winner casino includes online slot machines of different types (classic, video, progressive), traditional casino games, such as Blackjack or Roulette, various card games, including several types of Poker and several live casino games as well. All available games can be accessed directly through the web browsing app or program of the chosen device, there is no need to download and install a Winner app. In order to run the game in such a manner (instant-play mode), one would first need to install the Adobe flash player, if there isn’t an already installed version. The casino offers an extensive collection of over 100 various online slot machines, developed either by Playtech or by NetEnt. The collection contains different types of slots as well, including classic online fruit machines, progressive slots and video slots with a wide range of features. 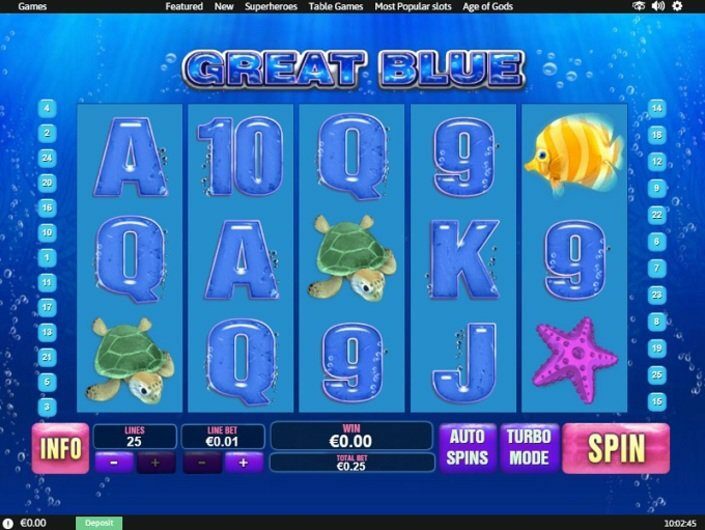 For easier managing, the website is equipped with several games sorting options as well as with a search bar, through which one can get directly to his favourite online slot machine. The vast majority of these slots are available for smartphones and tablets as well. Each game that can be played on such devices is marked with a mobile phone icon in the bottom left corner. They can be played for free or for real money, where you can potentially claim a massive payout. The tables below contain a selection of several most popular slots from both Playtech and NetEnt. If your favourite online slot machine is in one of the tables, the only thing left for you to do is to finish the Winner login process and start enjoying it! And if you are eager to find out about other casino games from the offer, the following parts of this Winner review will thoroughly overview them as well. The tables below contain some of the Blackjack games available at Winner casino. The tables below contain all available video poker games provided by the Winner online casino. This traditional casino game can be played on two different platforms, one developed by NetEnt and the other by Playtech. Net Entertainment produced two different types of this game. The first is simply called “Baccarat”, while the other is known by the name of “Punto Banco”. The main difference lies in the number of decks. Classic Baccarat uses 8, while the Punto Banco is played with 6 decks of cards. Additional details about both Baccarat software platforms can be thoroughly inspected by reading some of the Winner casino reviews. The Roulette game collection of the Winner online casino is predominantly based on the games developed by Playtech. One can play American and American Deluxe versions on a double-zero wheel with the house edge percentage of 5.26%. French Roulette and French Roulette Deluxe are played according to the La Partage rules with the house edge percentage of 1.35% on even money wagers and 2.70% for all other types of wagers. All remaining games are played on a single-zero wheel with the house edge percentage of 2.70%. All additional details about Playtech’s software platform for online Roulette can be found by reading some of the Playtech reviews. Card games category contains a wide range of various games, including several versions of Blackjack, Aces and faces multi-hand, casino Hold’Em Poker, Caribbean Stud Poker, Pontoon, Hi-Lo, etc. Arcade games category contains a high variety of casino games, including several versions of scratch card games (Gladiator scratch, Rocky scratch, Irish Luck scratch, etc. ), Keno, Cash Blox, Wheel of Light, virtual sports betting games (Derby Day Horse Racing, Virtual Horses), Penalty Shootout, several versions of Hi-Lo games (Genies Hi-Lo and its Premium version), dice games (Dice Twister, Roller Coaster Dice), Rock Paper Scissors, Jackpot Darts, etc. 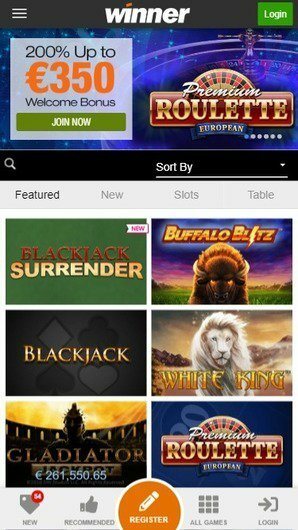 Winner live casino offers excellent real-time, live gambling experience accompanied by professional and polite dealers and high-quality video and audio live streams. Both depositing and withdrawal of the money are simple processes. The player needs to go to the casino’s cashier page and select the desired payment method in order to finalize either of these two processes. The first deposit bonus is reserved for new customers and comes with a match of 200% up to the amount of €350. Minimum required a deposit for claiming it is €40. Wagering requirements are set at 30x. The promotion is valid for 30 days. No deposit bonus is reserved only for newcomers, and it is being added to the player’s balance upon registration. All bonuses and promotions are subjected to the Terms and Conditions of the Winner casino.  Winner offers an excellent, stable and reliable mobile gaming platform. The vast majority of games available for a desktop/laptop are available also for smartphones and tablets. All games are perfectly adjustable to all screen sizes and resolutions. The best thing is that all games are instant-play, accessible directly through the web browser app. 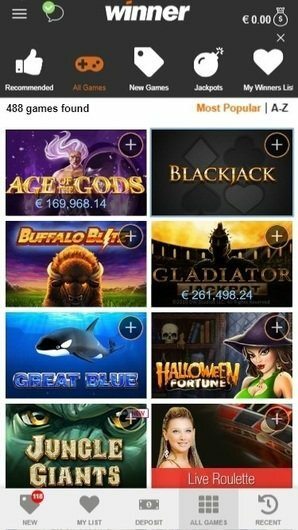 Winner casino provides the possibility to choose between 9 different languages, including English, Danish, Polish, German, Spanish, French, Portuguese, Swedish and Russian. Unfortunately, the casino doesn’t include a Winner casino live chat option as a service. However, all customers can reach the support service either via e-mail or by the phone number. Winner casino represents a safe and secure place for all players. Money transfers are secured with an SSL encryption protocol, which guards all sensitive personal and banking info, so no scam can be made. The winner also accepts online vouchers as a deposit method, and vouchers themselves are a kind of a security measure. Winner casino is a totally trustworthy website for online gaming, accredited with a license by the Malta Gaming Authority jurisdiction. The fact that Winner is successfully operating for almost a decade now only confirms the legitimacy. Withdrawal pending time goes between 0 and 96 hours. 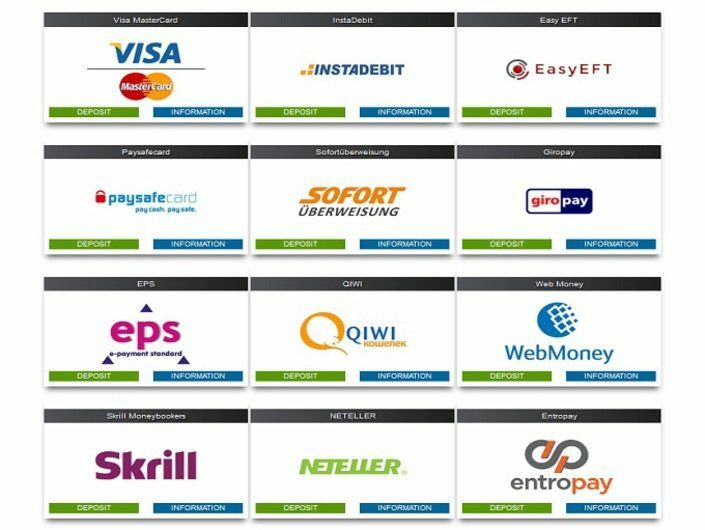 E-Wallets: 24-48h, debit/credit cards: 2-5d, Bank Wire Transfers: 2-7d and Cheques: 21-28d.